President Muhammadu Buhari says gunmen trained by the late Libyan President Muammar Gadaffi are the current herdsmen killing people across Nigeria. The President spoke at the Abuja House in London when Archbishop of Canterbury Justin Welby visited him. The gunmen, he said, escaped into Nigeria and other West African countries after Gadaffi’s death. He spoke, even as suspected herdsmen killed 13 people in Benue and Nasarawa states on Tuesday. Responding to Welby’s comment on the herdsmen and farmers’ clashes in some parts of the country, Buhari said: ”The problem is even older than us. It has always been there, but now made worse by the influx of gunmen from the Sahel region into different parts of the West African sub-region. “They were trained and armed by Muammar Gadaffi of Libya. When he was killed, the gunmen escaped with their arms. We encountered some of them fighting with Boko Haram. The President said “irresponsible politics” had been brought into the farmers/herders’ crisis, promising that enduring solutions would be found, and justice done to all concerned. He said he declared his second-term bid on Monday before his London trip because many Nigerians were “talking too much” about whether he was going to run or not. A statement by his Special Adviser on Media and Publicity, Femi Adesina, quoted him as saying: ”I declared before leaving home because Nigerians were talking too much about whether I would run or not. “So, I felt I should break the ice. We have many things to focus on, like security, agriculture, economy, anti-corruption, and many others. We needed to concentrate on them, and politics should not be a distraction. On Leah Sharibu, the Dapchi schoolgirl still being held by insurgents, reportedly because she refused to renounce her faith, the President said: ”We are managing the matter quietly. Making noise would not help. We are collecting as much intelligence as possible, working with the Red Cross and other international organisations. The President also recounted some successes of his administration, especially in agriculture. “We have cut the importation of rice by about 90%, saving billions of dollars in the process. People who rushed into petrol money have now gone back to agriculture. Even professionals have gone back to the land. Nigeria should be able to feed itself comfortably soon. I am so pleased,” he said. 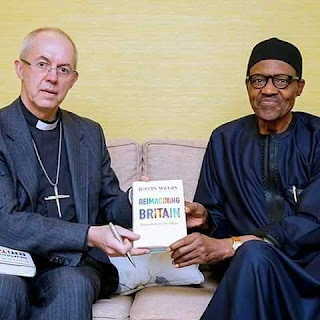 Archbishop Welby said it was always a delight to see President Buhari, “whom I have tremendous respect for,” adding: “You have my best wishes on your recent decision. I read your declaration speech. We are neutral as a church, but we will pray for you. Great statesmen are those who run for the good of their country.